Welcome to our next 'Did You Catch That!?' article capturing the action from Week 3 in the Big Brother House. I'll be covering everything that's happened since the 2nd eviction of the season on Thursday night up until Tuesday night on the Live Feeds. I'll include all the Live Feed action and newest episodes covering the new HOH's, nominees, Battle of the Block and PoV spoiler. When we left off early last week it looked like Zach had the votes to stay over Paola. It took some expert manipulating from Derrick to keep Zach safe, as we'll later see highlighted in the episodes this week. We saw the aftermath of the PoV Ceremony when Brittany, Pao and Zach put the house on blast but won't see how it went down until Thursday night's episode. We start with Wednesday night's episode which covered the end of Devin's reign as HOH. Hayden and Nicole are safe for the week after winning Battle of the Block, dethroning Amber as HOH. We get to see the fight between Devin and Caleb that I covered in last week's article where Devin blew up the Bomb Squad. If you haven't seen it, go back and watch how Team America formed in the backyard during Wednesday night's episode. Derrick, Donny and Frankie were given the code words 'bald eagle' and 'apple pie' to figure out who their other Team America members are. As Frankie said, they have the brains, the beard, and the beauty. We find out later that their first task is to start a rumor that one of the HG's is related to a former HG. We'll see how they did on the Live Feeds later. We also see Caleb tell Devin that Bomb Squad members are targeting him next week. Devin called another house meeting when Zach spoke up and became Devin's new #1 target. Zach told Devin that he would rather have Brittany stay and that he did tell others that he wanted Devin out soon. They showed us the PoV competition, which we already know was won by Devin, and Devin replacing Brittany with Zach as the new nominee. They didn't show us the PoV Ceremony blow up that we were all hoping for. Thursday night's episode will cover the veto ceremony blow up, the aftermath, the live eviction and 2 New HOH's. We start with the PoV Ceremony blow up featuring Brittany, Paola, and Zach. Brittany called out Paola for throwing the BoB competition, Paola called out Brittany and Devin, and Zach finished it off with an old fashioned Devin bash. It's definitely worth going back and watching again. We covered much of the aftermath from the Live Feeds in last week's article, as well as Derrick getting everyone on board to keep Zach safe. By a vote of 10-2, Paola was the 2nd HG evicted from the Big Brother house. Next, we saw the HOH Competition "Underwater Polo" that crowned two new HOH's. It was somewhat of a crap-shoot and the HG's had a chance to practice in the backyard the night before. It looked as though Nicole and Frankie would be the HOH's until Derrick took the last shot of the competition, scoring a 28 to knock Frankie off and join Nicole as the other HOH. When the Live Feeds come back we see that the plan is clearly to backdoor Devin this week. Devin told Derrick he could nominate him as he knew he was going to be targeted after the house went against his wishes and evicted Paola. There's no chance Derrick is going to give him 2 possible chances to win a competition and save himself. The plan is to put up 4 pawns and hopefully Devin doesn't play for the PoV. If everything goes according to plan it should be an easier week with everyone on board with getting Devin out this week. We got to see Derrick and Nicole's new HOH rooms Thursday Night and a lot of nomination talk to go with it. There were some conversations about who might be going up but it wasn't until Derrick got to Nicole that the nominations were solidified. It's clear that Nicole did not want to be HOH and wasn't trying to win the competition. Derrick and Nicole agree that the plan is to backdoor Devin this week and to nominate four pawns. Derrick suggested that Nicole nominate Amber for the least amount of blood on her hands, because Amber nominated her last week. He also thought that if he were to go tell Caleb that Amber is going to be nominated, that Caleb would then volunteer to go on the block and save her, and it happened exactly like that. Derrick decides that he will put up Caleb and Jocasta, with Nicole nominating Amber and somebody else. Derrick then had a conversation with Caleb about going up to save Amber from the block and he takes it hook line and sinker. This conversation was around 2 AM BBT and just another example of Derrick's ability to manipulate people. Right after that conversation we saw Derrick and Frankie talking about their first mission as Team America. We must have 3 HG's spread their rumor of someone being related to a past HG. Donny is sleeping so they'll fill him in tomorrow morning but they must complete the mission by midnight on Monday. Right now it looks like Derrick will nominate Caleb and Jocasta and Nicole will nominate Amber and Victoria. Nicole and Derrick are solidifying the plan to backdoor Devin by having Caleb throw the BoB competition and hopefully not have Devin win PoV so they can replace a nomination and evict him. Derrick and Caleb go over the plans before the nomination ceremony and put the plan into action. The feeds were blocked much of Friday afternoon and when they return we see that Amber/Donny were nominated by Nicole and Caleb/Jocasta were nominated by Derrick. Devin know realizes the plan is to backdoor him this week with his only chance being that he gets picked and wins the PoV competition. Derrick filled Donny in on the 1st Team America mission in the storage room Friday afternoon. Frankie joined and the three of them came up with the plan to say that Paola told Donny, on her way out of the house, that Zach was Amanda Zuckerman's cousin. They all agreed it sounded legitimate given their similar personalities and both being from south Florida. They decide to go spread to the dumbest people first, Victoria and Amber, and then Caleb because he loves bragging about information. The feeds cut again for the remainder of Friday afternoon while the Battle of the Block competition was going on. When the feeds returned we learned that Amber and Donny had won the BoB dethroning Nicole from HOH, which I'm sure she was perfectly fine with. We now have Derrick as the HOH with nominations of Caleb and Jocasta, hoping to be able to pull one of them off and replace them with Devin after the PoV competition. It also appears that Nicole has turned into a frog as the result of her being dethroned from HOH. Derrick, Caleb and Cody are talking up in the HOH about not telling anyone Caleb threw the competition as part of their plan to evict Devin. They all agree to take Caleb off the block if they win PoV. There are whispers from Cody and from Nicole about targeting Caleb if they have to, but Derrick thinks it's too soon for something like that. Brittany and others also discuss that Caleb is actually a bigger threat than Devin and wouldn't mind taking him out if given the chance. Two of the LTA (Los Tres Amigos) alliance members were discussing strategy in the Bee Hive room. Zach (Land Mine) and Cody (Rico Suave) were talking about plans moving forward to take out Donny, Caleb and Frankie soon, as they are their threats to make it deep. Derrick (Papa Bear) is the 3rd amigo but doesn't know exactly what the other two's real plans are. Cody and Zach discuss teaming up with Nicole and Christine but think Hayden might be in too deep with them to make it work. The plan moving into early Saturday morning on the live feeds is still to have someone win PoV and replace a nominee with Devin. It looks like Devin has accepted his fate and is actually being nice to everyone in the house for a change. Derrick and Frankie are going over their plans for the Team America mission and plan on starting to spread the rumor on Saturday. Cody joins those two in the HOH room and they discuss what could happen after the PoV tomorrow with the importance of making sure Devin or Caleb leave this week. The HG's wake up Saturday morning, some after only 2-3 hours of sleep, and get ready for the PoV Competition. After the feeds are come back from picking the PoV players we learn that Christine, Devin and Donny were picked to play along with HOH Derrick and nominee Caleb. Jocasta has been sick and will not participate in the PoV Competition. When the feeds come back after the PoV Competition we learn that Donny has won yet again and is planning on using it to pull Jocasta off the block. It looks like Devin will replace Jocasta and sit next to Caleb on the nomination chairs. Once that happens, it should be a pretty laid back week as far as the BB house is concerned. 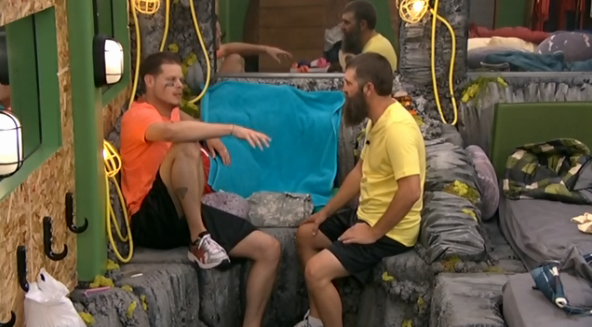 Derrick and Donny discuss pulling Jocasta off the block and putting Devin up in her place. We also had a mid-afternoon body building competition on the live feeds, hosted by Zach and judged by Nicole, Christine and Amber. Back in the Fire Room, Donny puts the PoV necklace around the sick Jocasta's neck assuring her safety this week. There's one last Team America meeting to make sure they're all on the same page about spreading the rumor that Zach is Amanda from BB15's cousin. Frankie will tell Amber, Donny will tell Nicole and Derrick will tell Victoria. 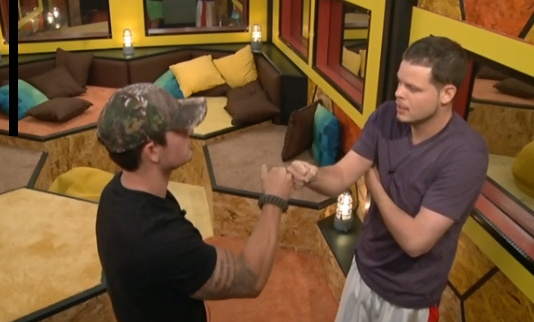 Derrick was the first one to discuss the Team America mission with another HG. He tells Victoria that he's trying to get to the bottom of a rumor he heard from Donny. Derrick tells her that Donny mentioned that Paola told him before leaving that Zach was Amanda Z's cousin. Derrick tells her to find out from Brittany if there is any truth to the rumor, knocking out phase 1 of the mission. 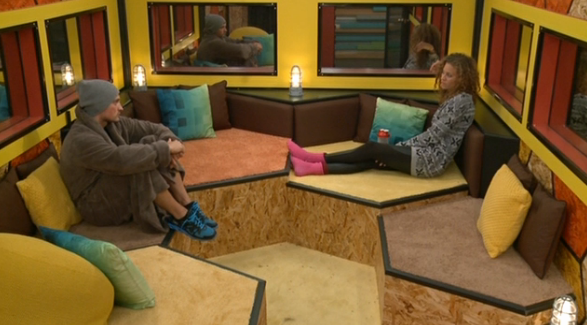 Donny and Nicole are talking in the Bee Hive room about an hour after Derrick's conversation with Victoria. He tells her that before Pao Pao left, she told him that Zach was Amanda Zuckerman's cousin to throw him under the bus. Nicole says she could see that being a possibility and Donny told her to run it by Christine because she's smart. Phase 2 is in motion. Later on, Frankie and Christine are talking on the hammock about Caleb and Amber being the targets once Devin leaves. They also discuss how Derrick, Cody and Zach are too strong of an alliance. There's starting to be some conversation about what happens if Donny doesn't use the PoV on Jocasta. Frankie and Zach are talking late night in the backyard about Caleb going home if the veto isn't used. Christine and Frankie have the same conversation later on in the night. 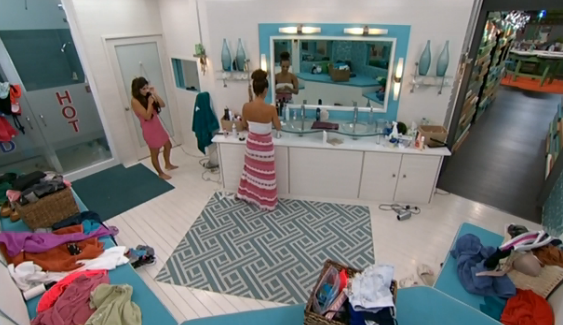 A bit later in the night Nicole told Christine about the Zach/Amanda rumor that Donny told her a few hours prior. That's one down for Team America. Both think it's really bizarre and not sure if Donny is trying to get them in trouble or if he's being honest. After Donny's conversation with Nicole she did go to Frankie and tell him she think's 'America's Player' is currently in effect, Donny isn't very good at this. It's another late night for the HG's, a few of them didn't even sleep again. Derrick, Cody and Zach were still up around 7 AM BBT playing pool and discussing whether or not Donny will pull Jocasta off the block later on that day. Zach and Cody finally got to bed around 9 AM and BB woke everyone up for the day about an hour later. Most of the HG's are wondering if the PoV ceremony will be today, not much action going on in the house. Derrick hasn't had any luck getting Victoria to spread the rumor so he tries Caleb on Sunday afternoon. He told him to run it by Amber and see what she says because she was close to Paola. Pretty laid back day on the feeds without the PoV ceremony and with everyone already knowing what's most likely happening this week. We're still waiting for the Team America rumor to continue spreading from Victoria or Caleb, they have until Monday at midnight to complete it. In Sunday Night's episode we'll see Derrick and Nicole's nominations and the Battle of the Block competition. We got to see Derrick and Nicole nominate Caleb/Jocasta and Amber/Donny accordingly. Nicole ended up going with Donny because he went and told his side of the house everything from his conversation with Nicole earlier that day. Jocasta and Brittany learned about Caleb's plans to throw the BoB competition from Donny, and he ended up on the block. 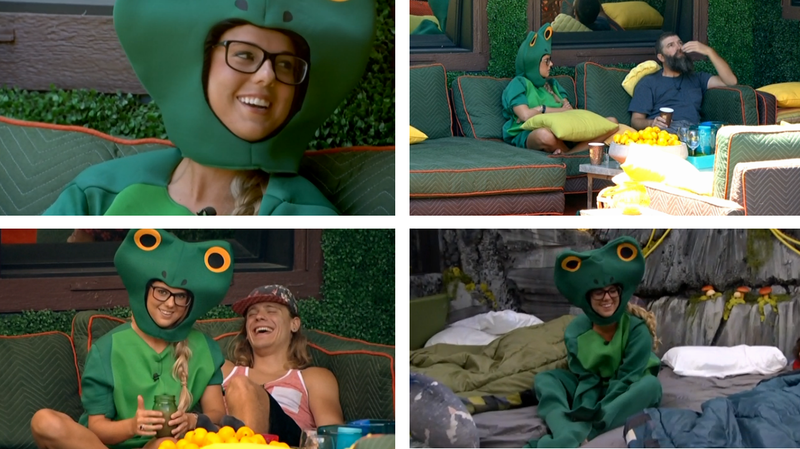 Next we watched Donny and Amber win the Battle of the Block, dethroning Nicole and turning her into a frog. The competition was wizard themed and required the HG pairs to work together while putting a puzzle together in the air. That's all we'll see for Sunday Night's show. We'll see the PoV competition that we know Donny wins and the PoV Ceremony on Wednesday Night's episode. The HG's are up still on early Monday morning talking about the PoV Ceremony taking place sometime on Monday. Most are talking about a possible back-up plan if Donny does not use the veto on Jocasta. Team America now has less than 24 hours to complete their 1st task. Derrick is telling Amber that Caleb has something to talk to her about inside, trying to get the rumor to spread. Derrick and Frankie talk about the mission later on upstairs and think Frankie might not even have to talk to Amber if Caleb takes care of it for them, they'll wait and see if they need to get more aggressive tomorrow. They plan on going straight to Zach about it if they can't get Caleb and Victoria to talk. Caleb came through around 4:30 AM BBT and had a conversation with Amber about Zach being Amanda's cousin, she didn't know anything about it and hadn't heard anything from Paola. BB wakes up the HG's around 9 AM as there will be the PoV ceremony today. Not a ton of game talk early on in the week, most HG"s know what the plan is for the week and are on the same page. The HG's are more focused on the next HOH competition and wondering if it will be endurance or not. Derrick planted another seed with Victoria to discuss Zach and Amanda with Brittany in the morning. She went straight to Brittany in the bathroom to ask her about it, completing Team America's task to have 3 HG's spread the rumor. 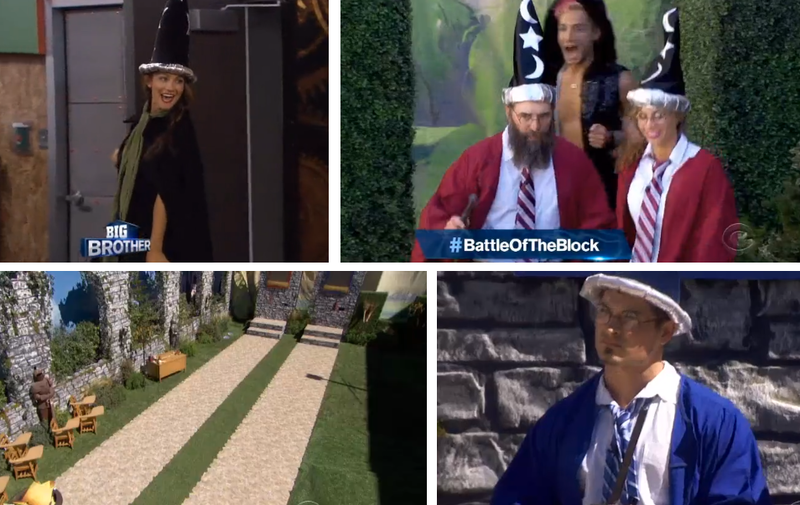 BB blocks the feeds for the Veto Ceremony and once they return we learn that Donny did use the Veto to save Jocasta and Devin was nominated in her place. We now have Devin and Caleb as the nominations for Thursday's eviction and we'll see how it went down on Wednesday Night's episode. We had a Team America meeting in the backyard Monday afternoon after they had completed their first task. They talk about asking Zach about the rumor to get him to discuss it with other HG's because they didn't know if Victoria had talked to Brittany yet, which she did. Zach and Derrick have a conversation in the backyard Monday night about turning the Los Tres Amigos (Derrick, Cody, Zach) into the Quad Kings with the addition of Hayden. I've seen Zach try and get at least 3 alliances started this week alone, usually involving a combination of either Hayden, Christine and Nicole. Cody doesn't want to involve those 2 girls only because he knows they're in with Hayden. It sounds like they will try and make the Quad Kings alliance with Hayden sometime soon. 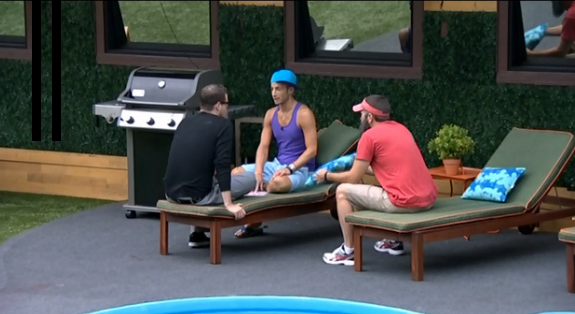 Donny, not knowing Team America already hit their quota, has another conversation with Brittany about the Zach rumor. She tells him that Victoria asked her about it earlier. Donny took this information up to Derrick in the HOH room to confirm their completion of the task. They now decide it's time to tell Zach so it doesn't look like the two of them were spreading rumors about him behind his back. I say two because Frankie never talked to anyone about it with Derrick and Donny doing the work this time. Derrick goes to get Zach and bring him up to HOH. They tell him the fake rumor about him being Amanda's cousin and he plays them a little bit saying that it's true, which must have been weird for them to hear considering they made it up. Zach goes to Frankie in the storage room and tells him about the Pao Pao rumor he just learned about from Derrick and Donny. Zach mentions that Pao Pao must have been America's player, Frankie laughs. Zach starts talking to the rest of the house about the rumor and most thought it was weird because people were trying to spread it around the house. As far as Devin goes, he tells everyone that he's accepted his fate and not going to be campaigning but then does the exact opposite. It will most likely be a 11-0 vote for Thursday Night's Live Eviction and Devin will be the 3rd HG to leave the BB16 house. I'll update if any new action goes down on the feeds before then but it looks to be a laid back week as far as the BB house goes. We'll see the PoV on Wednesday's episode and it should be interesting to see how they show Team America completing their first task. This wraps up the article, check back next week for all the new action from inside the Big Brother house!